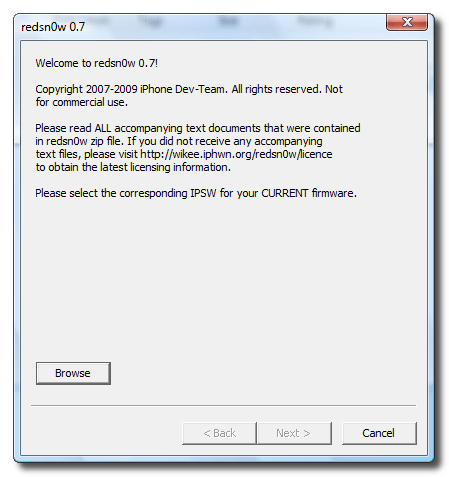 iPhone dev team recently released redsnow (redsn0w), a new tool that can easily jailbreak and unlock iPhone 2G and iPod Touch 1G and 2G. Here we present the step by step guide to unlock and jailbreak iPhone 2G. 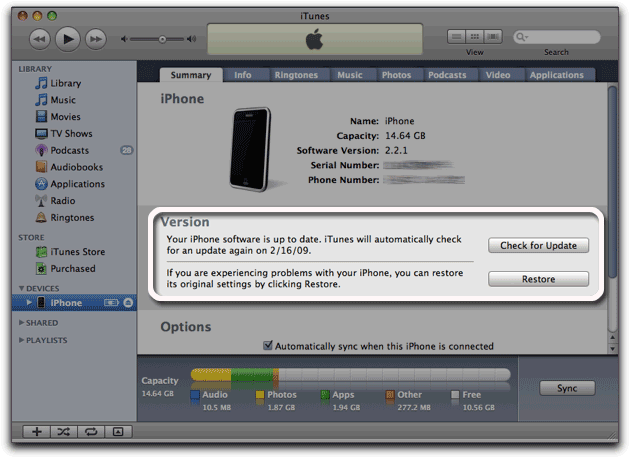 Note: If your iPhone is getting hanged at reboot, then you have not upgraded using iTunes first. This is very important. You have to first upgrade using iTunes and then use redsnow (redsn0w). Follow this guide and you’ll certainly be able to jailbreak and unlock your iPhone. No more “iPhone getting hanged at reboot problem“. Download iPhone 2G 3.0 firmware using direct download links posted at technonix. Download redsnow (redsn0w) using direct download links posted at technonix. 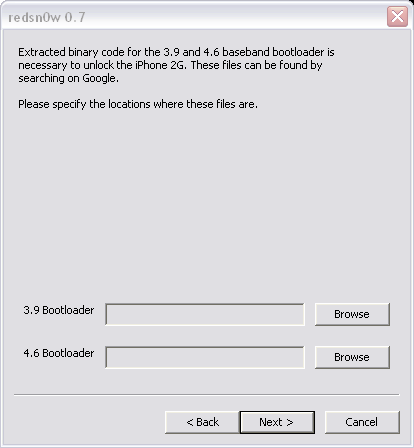 Download 3.9 and 4.6 baseband bootloader files here. Extract the archive. Use winrar if you can’t extract rar files. Open iTunes 8.2. It’ll detect your iPhone. Press Shift and Click Restore. Browse for the ipsw file downloaded in step 1. iTunes will upgrade your iPhone software to 3.0. At this point, iPhone would be locked and will display a “Slide for Emergency” message. Don’t worry, We’ll be unlocking it soon. Open redsnow (redsn0w). Browse for the firmware file downloaded at step 1. It’ll take some time and check the file. Click Next. There will be a popup saying “Preparing Ramdisk”. It’ll finish after sometime and next screen will follow. Select the check box saying Cydia. If you want to unlock as well, then check Unlock too. If you selected to unlock, you’ll be asked to provide 3.6 and 4.9 bootloader files. Browse for the files we downloaded at step 3. 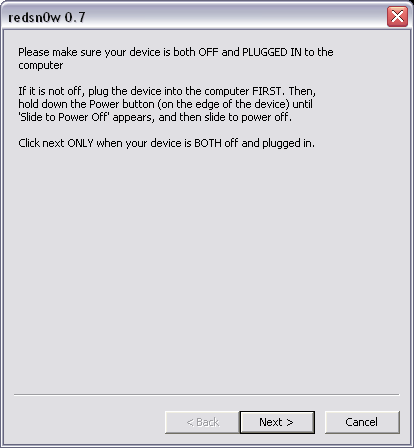 Turn Off your iPhone and plug it into your computer. If it was already plugged in, then simply turn it off. 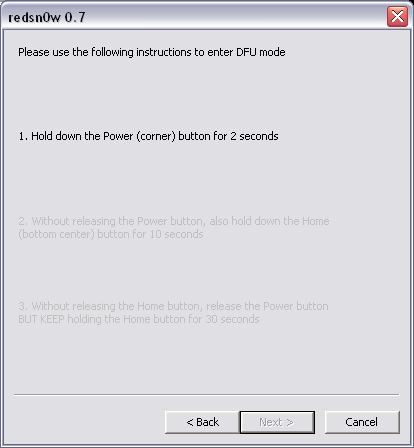 Redsnow (redsn0w) will guide you to put the iPhone in DFU mode. Do exactly as shown. Redsnow (redsn0w) will unlock and jailbreak your phone. Let it do its work. 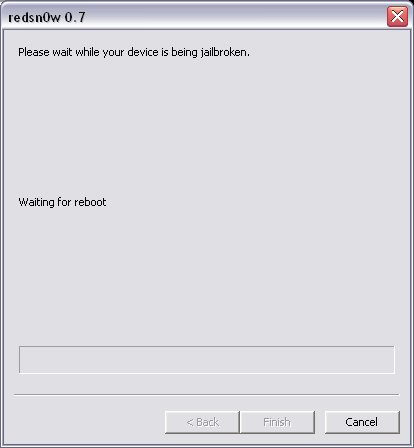 Your iPhone will be rebooted and will continue with jailbreak. Do not attempt to turn off the device at this time. Congratulations. You now have a fully functional iPhone 3.0 jailbreaked and unlocked using redsnow (redsn0w). OMG! Thanks so uch u were a great help! Well, good news for me, thanks! the post. I wil certainly return.